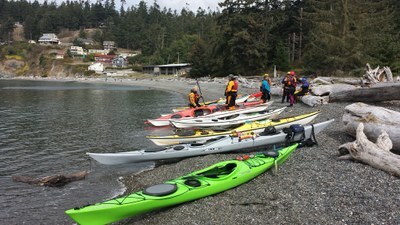 This activity is part of the Intermediate Sea Kayaking Course-Everett - 2017+ course. To register for the course, register or cancel lectures and field trips, or cancel entirely from the course, visit the course page. Bowman Bay launch at 8:30am. Ready to begin session on land at 9:00am. Please note: there are two back-to-back sessions of this event on subsequent days. Campground reservations have been made at Deception Pass State Park for Friday and Saturday nights, June 22nd and 23rd - if you would like to camp the night before your session, please contact the trip leader. Each day requires a separate registration - you are welcome to register for one or both days. Launch and landing at Bowman Bay, which involves a Discover Pass. This work has two principal development goals: 1)develop fundamental skills that tend to apply in a broad range of circumstance; 2)develop composure to perform in challenging conditions. Plan on some physical effort, plan on being in the water, plan on being task saturated, and plan on significantly improving your paddling capacity in challenging conditions. You are welcome to attend either day if you cannot make both, but we will not know which topics are on which day until we see weather forecasts a day or two out. Drysuit and helmet designed for water. All equipment for a kayak day trip on open water. Hood recommended.